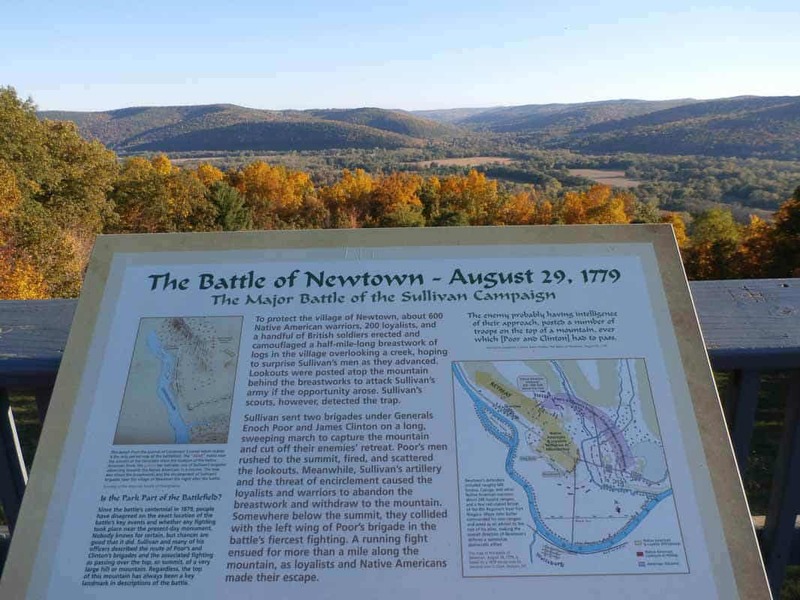 The Battle of Newtown was a major battle of the Sullivan Expedition, an armed offensive led by Major General John Sullivan that was ordered by the Continental Congress to end the threat of the Iroquois who had sided with the British in the Revolutionary War. John Butler and Joseph Brant did not want to make a stand at Newtown, but proposed instead to harass the enemy on the march. They were overruled by Sayenqueraghta and other Indian chiefs. 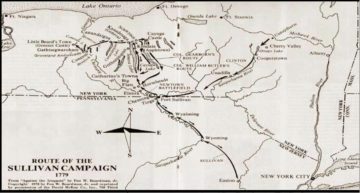 The Battle of Chemung was the only other major battle of the Sullivan Expedition. 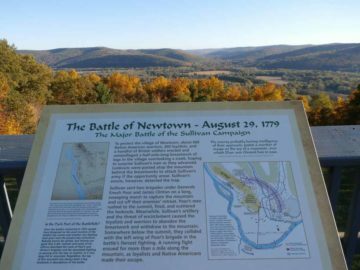 This battle, which was the most significant military engagement of the Sullivan Campaign of 1779 and played a crucial role in America's Revolutionary War, took place at the foot of a hill along the Chemung River just outside what is now Elmira, New York. Armies - American Forces was commanded by Gen. John Sullivan and consisted of about 3,462 Soldiers. British Forces was commanded by Walter Butler and Chief Brant and consisted of about 600-1,200 Iriquois and Soldiers. Casualties - American casualties were estimated to be 11 killed and 32 wounded. British casualties were estimated to be 17 killed, 16 wounded, and 2 captured. 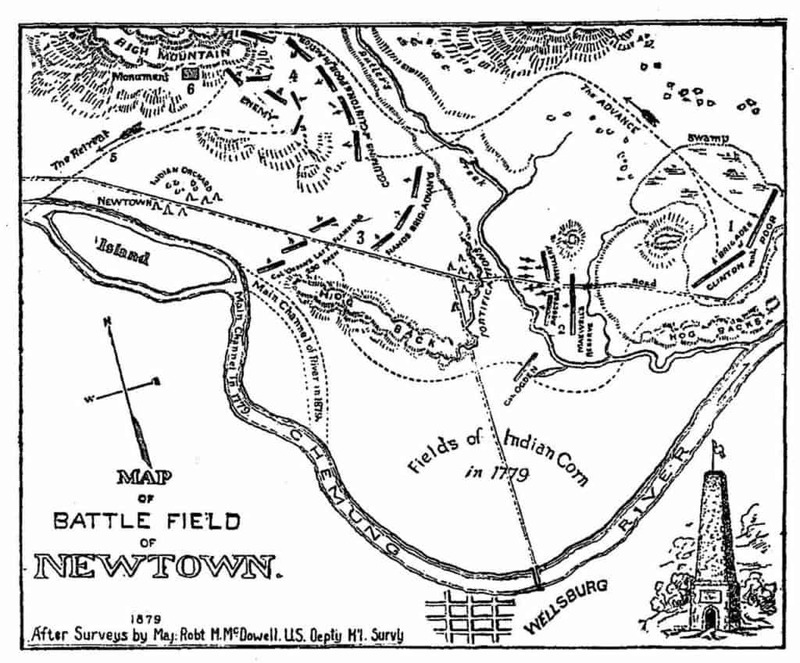 The engagement occurred along a tall hill, now called Sullivan Hill and part of the Newtown Battlefield State Park. The hillside, running southeast to northwest next to the Chemung River, was a mile long at its crest, which rose 600 feet above the road at its base leading into Newtown. The slope of the hill was covered with pine and dense growth of shrub oak. Hoffman Hollow, a marshy area of small hillocks and thick stands of trees, was just to the east of the hill. A small watercourse, called Baldwin Creek, ran through the hollow and emptied into the Chemung River (referred to as the Cayuga branch in Sullivan's reports). The creek followed the hill northwest on the opposite side from the river and had steep western banks. On August 26, Sullivan left Fort Sullivan, where the two columns of his army had converged, with an estimated five thousand well armed and now freshly provisioned troops. They marched slowly up the Cayuga branch of the Susquehanna to destroy the towns and crops of the Six Nations in western New York. On August 29, just ten miles upriver from Fort Sullivan, the advance guard, three companies of riflemen formerly with the Provisional Rifle Corps of Colonel Daniel Morgan, reached the area at mid-morning. Suspecting an ambush, they halted and scouted the area. Between 11:00-11:30 AM, they discovered the hidden breastworks and immediately notified Brigadier General Edward Hand. He dispatched his light infantry to take up firing positions behind the bank of Baldwin Creek and fire into the breastworks, prompting the defenders to make several unsuccessful attempts at luring the Continentals into an ambush. As the extended army continued to arrive and assemble, Sullivan called a council of war with his brigade commanders, which began at three in the afternoon. Together they devised a plan of attack. 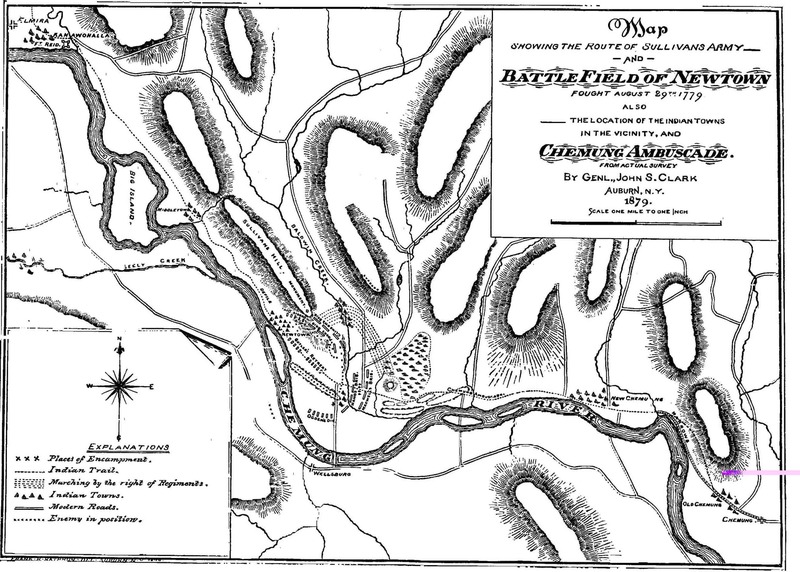 The 1st New Jersey Regiment, commanded by Colonel Matthias Ogden, was detached from Brigadier General William Maxwell's New Jersey Brigade and sent west along the Chemung River to execute a flanking maneuver on the Loyalist-Indian forces. Similarly, the New York Brigade of Brigadier General James Clinton and the New Hampshire Brigade of Brigadier General Enoch Poor were dispatched together eastward, along a circuitous route through Hoffman Hollow, with the mission of approaching the hill's eastern flank and then facing left in preparation for a full ahead assault upon the enemy. Meanwhile, the unified forces of Sullivan's Pennsylvania and New Jersey brigades remained behind at the ready, bolstered by a provisional regiment composed of all the light infantry companies in the expedition. At the end of the first hour, the artillery of ten guns posted on a rise near the road, would open fire on the breastworks and the areas between them. These guns would signal Hand to feint an attack with that provisional regiment upon the center of the horseshoe, at which time the brigades to the east would swing inward, assault the summit of the hill and turn their attack to the left and rear of the breastworks. When the guns of Poor's and Clinton's attack were heard by Hand, his brigade would storm the works, supported by Maxwell's brigade, putting the defenders in a crossfire. The plan was complex and conceived on short notice but executed with vigor. The ultimate result was a resounding defeat for both the British Loyalists and the Iroquois at their side. 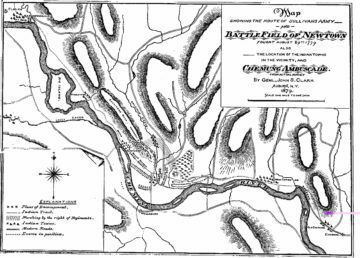 Crossing the swampy marsh in Hoffman Hollow slowed the advance of Poor's and Clinton's brigades, disrupting the timing of the plan, and this provided just enough delay to allow the joint Loyalist-Iroquois forces to escape encirclement. Nearly all of the Continentals' casualties occurred in the attack of Lieutenant Colonel George Reid's 2nd New Hampshire Regiment. Assigned to the extreme left of Poor's assault formation, it climbed where the slope was steepest and lagged considerably behind the rest of the brigade. Joseph Brant led a counterattack of Indians and nearly encircled Reid. The next regiment in line, the 3rd New Hampshire Regiment of 28-year-old Lieutenant Colonel Henry Dearborn, about-faced, fired two volleys and attacked down the hill. Clinton, whose brigade was climbing the hill below and slightly to the right of Poor, sent his 3rd and 5th New York Regiments to help, and the counterattack was crushed. After razing three more towns and destroying all foodstuffs in the vicinity, Sullivan's army marched north during the next three weeks against demoralized opposition and successfully completed their campaign. 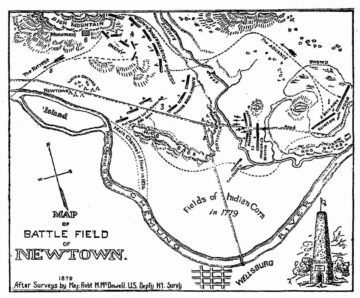 Historian Allan W. Eckert wrote: "The Battle of Newtown had certainly not been a bloody battle compared to others, but it was most certainly a significant one. This was the battle that broke the back of the Iroquois League...and the hearts of the people of the Six Nations."